In an exciting partnership of electronics and pharmaceutics, Medimetrics Personalized Drug Delivery are collaborating with Bio-Images Research to bring IntelliCap, the most advanced electronic drug delivery capsule to date, to the forefront of clinical research. IntelliCap is a groundbreaking system that allows unparalleled control in drug delivery for rapid, reliable candidate screening. 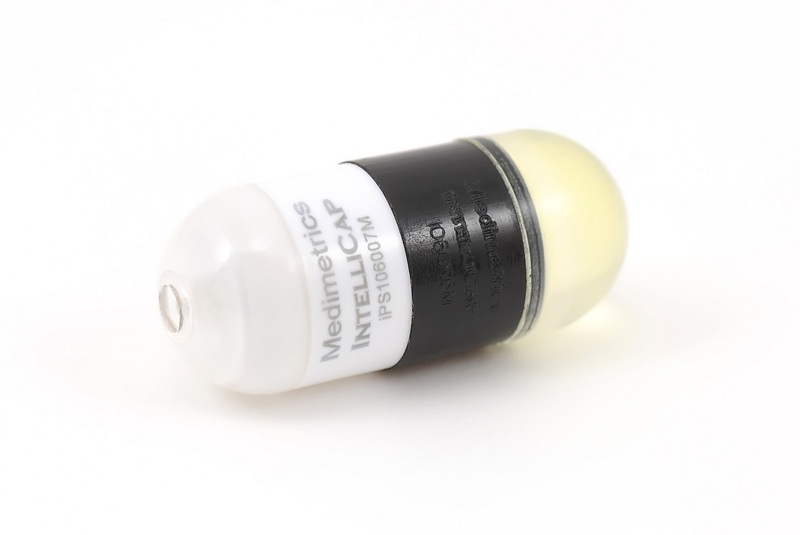 Medimetrics’ IntelliCap is a wirelessly controlled, electronic capsule system that delivers formulations to user-defined regions of the gastrointestinal tract for regional absorption studies. The 11 mm x 26 mm (approximately ‘000’ sized) CE-marked device is composed of a microprocessor, battery, pH sensor, temperature sensor, wireless transceiver, fluid pump and drug reservoir capable of storing up to 275 µL of test compound. It communicates via its wireless transceiver to an external control unit worm by the subject. IntelliCap is the first device that allows patient-specific drug delivery by combining electronically controlled drug delivery with real-time monitoring and patient communication. Moreover, unlike existing electronic delivery systems, it allows completely responsive, customizable release profiles, rather than single-pulse release of the entire payload. Delayed, extended and multiple pulsed release profiles are all achievable with ease. Leading experts in clinical scintigraphy for drug delivery studies, Bio-Images Research, have partnered with Medimetrics to make IntelliCap available to the pharmaceutical industry as an advanced clinical research tool. Radiolabelling and scintigraphic monitoring of IntelliCap allows unequivocal confirmation of its position within the GI tract at any given moment, affording unrivalled precision in targeting drug delivery. This increases confidence that the drug is released at the desired site, maximizing the value of clinical studies and potentially reducing patient numbers.